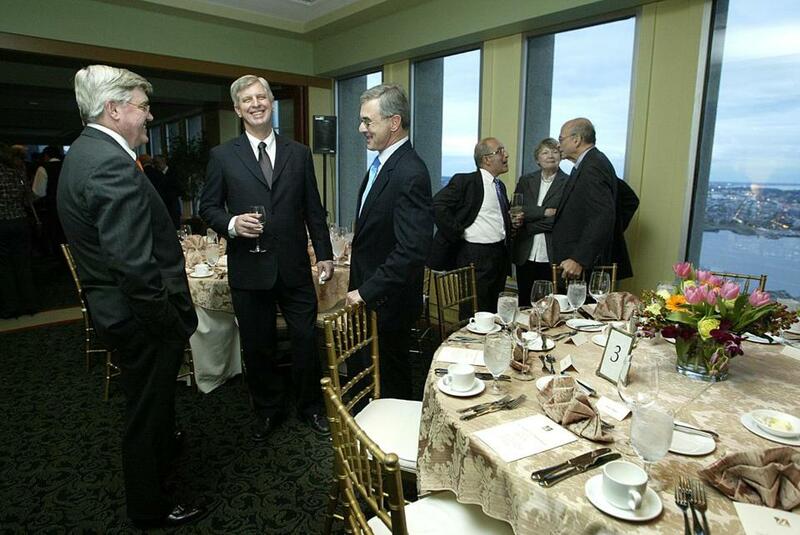 Emmett Hayes, former UMass president Jack Wilson, and former governor Paul Cellucci attended a party in 2005 at the University of Massachusetts Club. The club will move to 1 Beacon St. this year and operate under new management. It was envisioned as a networking hub, a fund-raising tool, and a badge of prestige for a state university system often overshadowed by its elite private rivals. As a bonus, the plush alumni club would pay for itself through membership dues and fees, University of Massachusetts officials said. But a decade later, the private UMass Club, located on the penthouse floor of a downtown Boston high-rise, has yet to live up to its trumpeted potential. 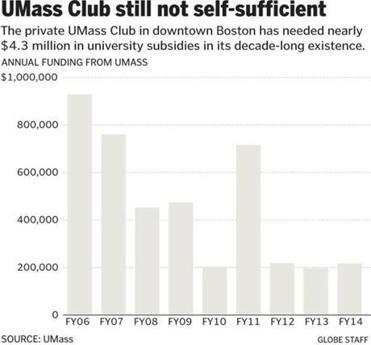 UMass has given the club subsidies totaling nearly $4.3 million since it opened in 2005, because the facility has been unable to cover its annual operating expenses. This year, as the university prepares to raise students’ tuition and fees by 6 percent to 8 percent, that subsidy is projected to be a quarter-million dollars. In an acknowledgment of the club’s struggles, UMass plans to move the facility to what it considers a more desirable location, replace its management team, and hire a prominent Boston public relations firm to lead a marketing campaign in hopes of boosting membership. The university has nearly maxed out its ability to borrow, and its debt is far outpacing revenues. UMass, which receives 17 percent of its $3 billion budget from the state, says no taxpayer or tuition dollars have been used to support the club, which is located on the 33d floor of 225 Franklin St. in the Financial District. Instead, it is subsidized through the university’s unrestricted operating budget, which includes money from licensing fees, bookstore income, and private fund-raising, according to Scales. But critics say any UMass revenue spent on the club is money diverted from educational purposes and should be considered public dollars. Nationwide, university-run private clubs have an uneven track record. Many closed or suffered membership losses after the 2008 recession. Boston University had a short-lived alumni club at 60 State St. that was shuttered about six years ago after proving “not viable,” according to BU spokesman Colin Riley. The 2,000-member Boston College Club, at 100 Federal St., is profitable enough that last year it funded $475,000 in student scholarships, according to John “Jack” Joyce, a managing director at Deutsche Bank and BC Club founding member. Northeastern University does not have a downtown club, but its alumni can join the Harvard Club at 1 Federal St., which is also open to other “partner schools,” although the Harvard Club’s Back Bay location, at 374 Commonwealth Ave., is only for graduates of Harvard, MIT, and Yale, as well as their children. The Harvard Club, with more than 5,000 members, has run a deficit in recent years, partly due to a $4 million settlement, disclosed in 2012, of a lawsuit over its tipping practices. But its chief financial officer, Michael Jenkins, said he anticipates the club will finish this year in the black. The UMass club has about 870 members, despite its original goal of at least 1,500 members. And UMass officials are unable to say if it has delivered on one of its main selling points: increasing donations to the university. 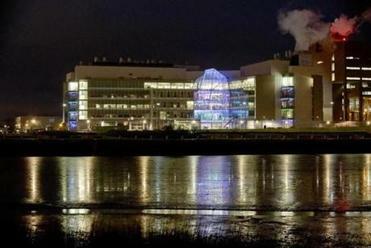 According to the terms of UMass’ contract with the company that manages the facility, ClubCorp, any shortfall in the club’s operating budget is the responsibility of the University of Massachusetts Building Authority, the UMass system’s real estate arm. This year, the building authority projects that the club will have just under $2.5 million in revenue and about $2.7 million in expenses. Members of the University of Massachusetts Club, which is not limited to UMass graduates, pay initiation fees of between $250 and $600, plus monthly fees ranging from $20 to $122. Membership includes access to the club’s restaurant and social events. Before deciding to open a club, UMass surveyed 14,500 alumni, and almost a quarter said they would join. Membership had hit a high of around 1,100 before the recession, according to Scales. UMass officials say they hope several upcoming changes will increase the club’s membership and visibility. Later this year, it will move to 1 Beacon St., a location expected to draw from the State House and Beacon Hill, and it will not be renewing its 10-year contract with ClubCorp, Scales said. Instead, the club will be managed by UMass Amherst’s dining service program, which last year was ranked by the Princeton Review as having the second-best campus food in the nation. The club’s annual rent at 1 Beacon will be $1.1 million — it now pays $700,000 at 225 Franklin — but UMass officials say the new site will be more conducive to events such as weddings, increasing the club’s money-making potential. UMass is hiring Regan Communications to promote the club’s changes and amenities. With roughly 460,000 UMass graduates worldwide, including almost 280,000 living in Massachusetts, UMass says the club’s potential remains high. 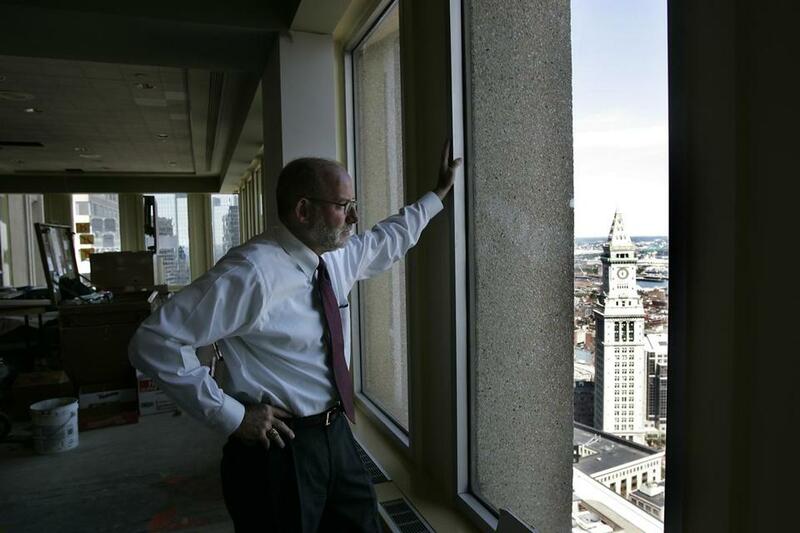 Robert M. Goodhue, then executive director of alumni affairs at UMass, checked out the view of downtown from the UMass Club’s original location.